We kicked off this Banned Books Week with challenges to two classics, and we’ll be wrapping up the week with news of a ban of another book: Lauren Myracle’s l8r, g8r. It really is the things they talk about. I was angry. I was like, ‘you’re kidding me’. This is what they’re exposing our kids to, and you think the library is going to be a safe place for your child to go check out a book. Elle further contends that the book will lead readers into promiscuity and provides them with tools for hooking up online. 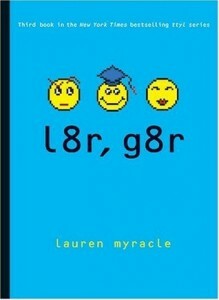 l8r, g8r is the third novel in Myracle’s young adult series that also includes ttyl and ttfn. All three books are written in instant messages among teenage girls, incorporating teenage slang, shorthand, and sometime profanity. All three books have been attacked by censors, in particular l8r, g8r, which has been targeted for the inclusion of sexual content. 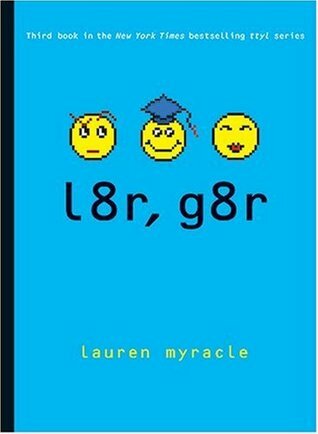 l8r, g8r addresses themes of friendship and examines how friendships among girls are impacted by romantic relationships. The Fox 10 news report itself is far from unbiased, with reporter Danielle Miller calling the sexual content in the book “pretty bad” and citing the book’s inclusion at the top of ALA’s annual list of the most challenged books in 2009 and 2011 to prove her point, completely overlooking the fact that the ALA list is compiled as a tool to fight censorship, not to endorse it. Miller also trots out the old chestnut about the content being too explicit to share excerpts on TV and shared shots of a heavily highlighted and tagged copy of the book. The district doesn’t appear to describe a specific materials review policy, instead subscribing to Arizona School Boards Association guidelines, which give the district Superintendent wide leeway to establish policies regarding “objectionable materials.” Unfortunately, the school district wasn’t inclined to stand by the right to read. The school’s principal apologized to Elle’s husband, informing him that the book has been pulled from the library and that it will be removed from other libraries in the system. The ban itself appears the have happened a couple of weeks ago, but it must have been a slow news week for Fox 10, whose skewed reporting hit the airwaves this week.